Do you hate the idea of pulling out the ladder and climbing up to clean those clogged gutters? Clogged gutters are more than just a nuisance. Gutters are an important component to help protect your home against water damage. If your gutters are not allowing the water to flow properly, it could result in water backing up under the roofline or behind your siding. This could result in interior water damage to your home. If you need new gutters, American Eagle Exteriors has just the right product to fit your specific needs. Today’s gutters are seamless and durable, and require little or no maintenance. 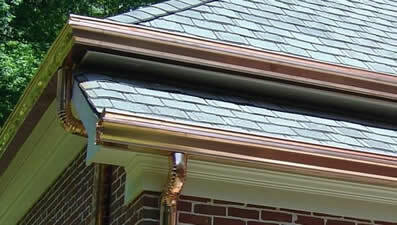 We install products from Gutter Drain as well as copper gutters. Our team are both trained and certified for installation of these products. Call American Eagle Exteriors for a consultation and to find the right gutter solution for your home.